Welcome to The Cucamonga State Preschool! Recently, many cities, school districts and other public entities have had their election systems challenged under CVRA, leading to very expensive and divisive litigation. The Cucamonga School District’s Board of Trustee’s preference is, and always has been, to avoid expenditures that do not directly benefit the children, families, and communities we serve. While Cucamonga School District believes its elections have not been racially polarized, a move to by-trustee area elections enables us to move forward without the potential of having to defend CVRA litigation in the future. District staff and the Board are committed to continuing to focus on the District’s core mission – providing the highest quality education for all of our students. The change in our system of electing trustees will not change the Board’s history and commitment to making decisions based on the interests of the entire District, regardless of where individual trustees happen to reside. The transition to a “by-trustee” area election method will involve input from the community at public hearings on options for developing and approving a trustee area map; approval from the San Bernardino County Committee on School District Organization; and a waiver from the State Board of Education. At the regular meeting on Thursday, April 20, 2017, the Cucamonga School District Board of Trustees listened to a presentation on the CVRA. This presentation was prepared and presented by an attorney from the law firm Atkinson, Andelson, Loya, Ruud & Romo. In this transition, the District has initiated the creation of election areas that would be roughly equal in population and in compliance with State law, the Federal Voting Rights Act, and the United States Constitution. 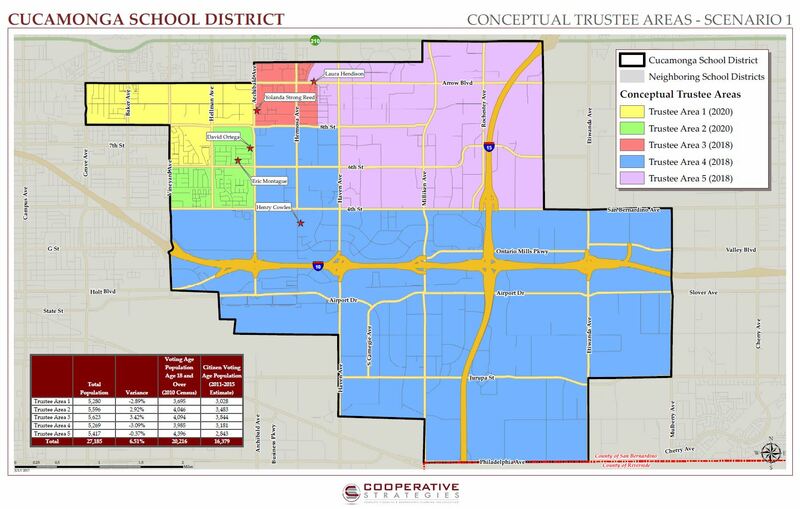 Using data from the 2010 Census, the District’s consultant, Cooperative Strategies, will create conceptual trustee area scenarios that divide the District into five new voting areas. The process will include hosting a series of public meetings to collect community input regarding the proposed area maps and allowing community members to view the conceptual trustee area scenarios and provide comments. Following community input, it is anticipated that the Board of Trustees will choose the final map at a meeting in the fall of 2017. Information provided on the boundaries of the District, the total population and demographics of the District, and information on the timeline for considering the creation of trustee areas. Information provided on the two conceptual trustee area scenarios, including the boundary lines and population data as well as the ability to review data on individual areas and see the impact of potential adjustments to the scenarios. Opportunity to provide written comments and suggestions on proposed trustee areas (comments received will be summarized and reviewed by the Board of Trustee). Following community input, on November 9, 2017, the Board of Trustees took action to adopt Map Scenario 1. And, adopted Resolution 1790.08, Recommending that the San Bernardino County Committee on School District Organization Approve and Establish Trustee Areas from which the Cucamonga School District Trustees will be Elected in a By-Trustee Area Election Process. On November 9, 2017, the Board approved Resolution 1790.09, Authorizing Request for Waiver of the Requirement that the Establishment of Trustee Areas and Adoption of a "By-Trustee Area" Election Process be submitted to the Electors as Set Forth in Education Codes Sections 5019, 5020, 5021, and 5030. The San Bernardino County Committee on School District Organization conducted a public hearing on February 21, 2018 and unanimously adopted Resolution No. 20180221-1 Adopting and Approving a Final Trustee Area Plan for Cucamonga School District to Transition to a By-Trustee Area Election System. On March 15, 2018, the State Board of Education (SBE) approved the District's Waiver Request to waive California Education Code Section 5020, and portions of sections 5019, 5021, and 5030, that require a districtwide election to establish a by-trustee-area method of election.